For the last few weeks I have been teaching my pupils to recognise and “sound out” words that contain a split digraph (a_e, e_e, i_e, o_e, u_e). A ‘split digraph’ means that a vowel sound has been split. 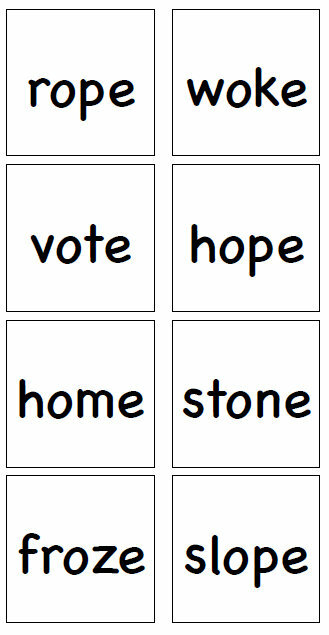 The end vowel (the ‘e’) reaches back over the consonant to make the previous vowel say its “name” and not its “sound”. The sound is now a long vowel sound as in: make, Pete, bike Rome, broke and mule. Teaching phonics in the small group setting of Power Hour is fantastic. Children have so many more opportunities to interact and learn. I just love playing games with my groups. Bingo and “Roll, Say, Keep” are always popular. It would be dangerous to wear out the novelty factor of these games though! We played “Roll, Say, Keep” last week and Bingo the week before. What to do!!! Well, I sat down the other evening and would not allow myself to leave my study until I had come up with a new split digraph game. I spent some time looking through MS Word Clip Art and then it came to me! It’s called “Hot Potato” and my class are going nuts over it!!!! Hot Potato is a variation on a classroom game that I have been playing for years called Crash. When you read the instructions I am sure that you will all recognise the game. I just “re-packaged” it. Just like you can’d hold onto a hot potato you can’t hold onto your cards if you draw it from the bundle! Anyway, here’s how to play Hot Potato! Print, laminate and cut out all of the cards. There are over 70 word cards! Bundle them into a deck of cards and shuffle. Turn the cards face down on the table. Children take it in turns to turn over the top card. If the child can read it then he/she can keep it. 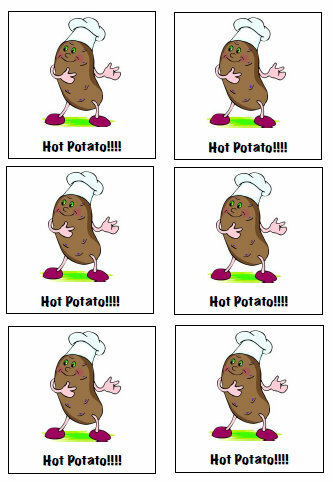 If a child gets the “Hot Potato” card then he/she must give back all of the cards!! I hope that you all have as much fun practicing your split digraphs with this game as we did. I tried to have a balance of words so that all of my pupils could win some cards.There are a few tricky words in there just to keep them on their toes! Yogurt Cake will help your maths! I just made this game up for my class of 4 and 5 year olds but I used the Jolly Phonics sounds we’ve been learning instead of words. Looking forward to trying it out very soon.